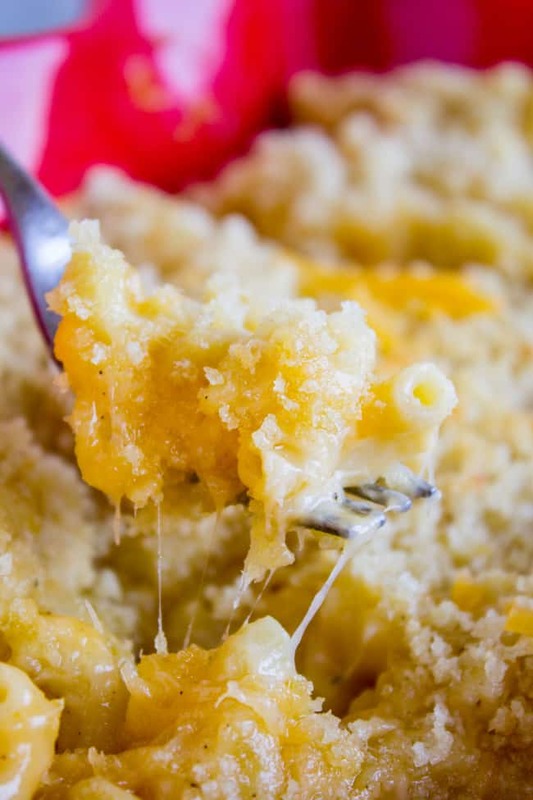 This is the Best Mac and Cheese recipe ever! I’m not kidding guys.When I put this in my mouth the first time, I literally stopped to shout hallelujah. Okay not really, but I’m telling you it is SO CREAMY AND SO CHEESY and so worth it. Homemade mac and cheese contest! Here we are at our block party last weekend. I was like, Tyrone, if you seriously think your mac and cheese is better than mine, then we need to put this to a vote. So we each brought a pan to the block party and made people pick which one they liked better. Despite an entire week of trash-talking me, I DESTROYED HIM. See those 2 X’s for his mac and cheese? One was a pity vote from me. The recipe is from my awesome friend Hannah. 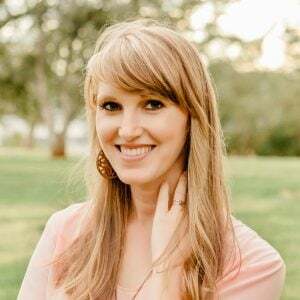 One night I stayed home sick (first trimester blues) on a night that the Young Women at church were having an activity (Hannah and I are their counselors). They made this homemade mac and cheese and doorbell ditched me a big bowl of it. Eric brought it to me and when I smelled it I almost lost my lunch. But then the next day I was in the mood for it (being pregnant is SO WEIRD). I tried it and could not believe how amazing it was. I had never had baked mac and cheese like this! 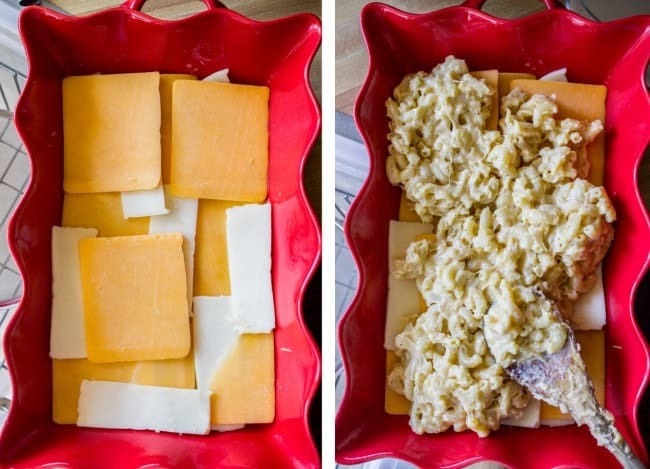 How to make the best mac and cheese recipe… ever! I’m a mac and cheese purist, so you won’t find any bacon in this recipe, but when Hannah told me that there was a half pound of cheese layered in the center, I definitely thought of this menu description. It’s perfectly appropriate. ALL THE CHEESE. The cheese sauce is super thick. You will feel ridiculous adding all this sliced cheese. DO IT. Look at that beautiful cheese layer! Oh and just in case you thought this wasn’t decadent enough, it calls for CREAM in place of some of the regular milk. We may be dying young, my fellow Americans, but we will die happy. Fat and so, so happy. Preheat your oven to 350 degrees F. Grease an 8x8 pan (or any 2 quart casserole dish) with butter or nonstick spray. Meanwhile in another smallish pot, melt 1/4 cup butter. Once it is hot, whisk in the flour. Cook 1 minute whisking, until it is bubbly. Slowly stir in the cream and milk. Stir the whole time until it is thick. Add salt and pepper and stir 1 more minute. Remove from heat and gradually stir in the shredded mozzarella and cheddar. If it is not melting, put it back on the burner over very low heat, stirring until the cheese is incorporated. Stir the cheese sauce into the cooked macaroni. It's pretty thick. Pour half of the mac and cheese into the prepared casserole dish. Add the 1/2 pound layer of cheese slices. YES DO ALL OF IT. Pour the other half of the mac and cheese on top and spread. In a small bowl, melt 1/4 cup butter. Stir in the bread crumbs. Spread the mixture on top of the mac and cheese. Bake for 20-25 minutes at 350. The top should be turning golden brown and the mac and cheese should be bubbly. *Or you can omit the cream and do 1 cup milk total. If you're not in it for the win. **Cheese of your choice. I did half sharp cheddar and half Monterey Jack. Make ahead: You can assemble this (without the crumb topping) ahead of time (1-2 days), and store covered in the fridge. Add the crumb topping and then bake when you are ready to serve. You will have to bake it longer if you put it in the oven cold, I would guess at least 30-40 minutes. Source: This recipe is from my girl Hannah. Thanks for sharing Hannah!! Homemade Macaroni and Cheese << this is a classic recipe from my mother-in-law. 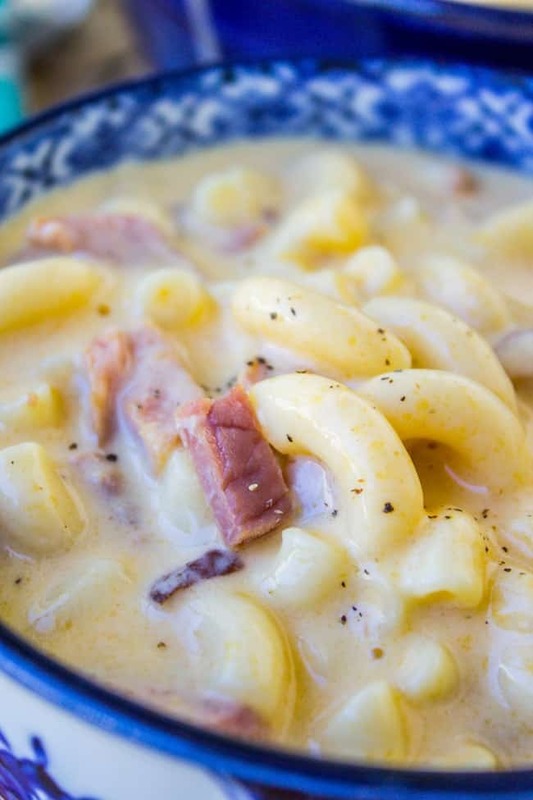 Ham Mac and Cheese Soup << this is such a crowd pleaser! 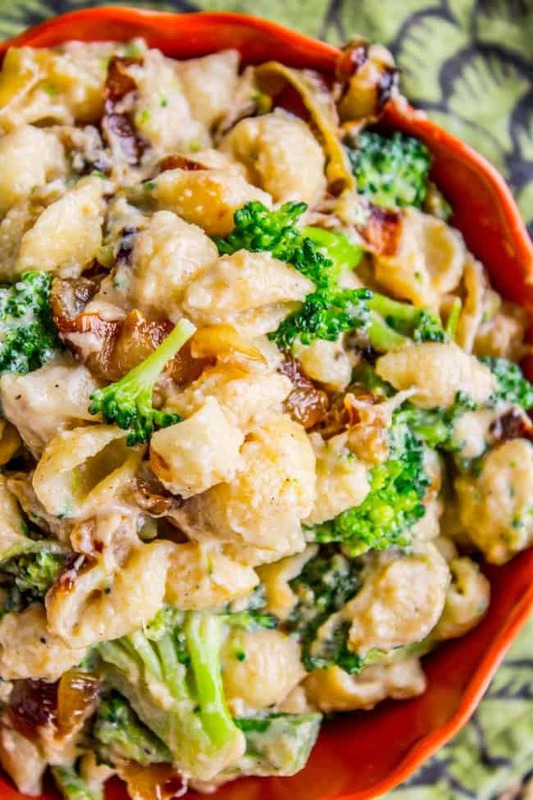 Mac and Cheese with Caramelized Onions and Broccoli << a liiiittle healthier than average. I am in the process of making this right now. I already have the sauce ready to go and boy is it sure thick. I used sharp cheddar and monterey jack. Waiting on my shells to get done. Will update after the 14 year old boy gives it either thumbs up or down. How did it go Cathy? What extra cheese did Y’all ladies use? I’ve beem trying different Mac and cheese recipes for about 2 years in search for one that our whole family loved….made this recipe tonight and I OMG! It was amazing and loved by all! For sure the best Mac anc cheese I’ve ever had and will be my go to recipe from now on. I sprinkled a bit of frank’s red hot sauce powder on top of mine only as my kids…and husband don’t like anything spicy (what a chicken lol ) It have it a nice little kick. I’ve read other ppls comments about little things they’ve added and am looking forward to trying them. 1. If you are planning to make this for a larger crowd or serve as a Main then I would suggest doubling if not tripling the recipe. I converted the ingredients to include an extra half of everything and used a 3 quart rectangle glass baking dish. I should have just doubled it as it still would have fit in that size dish. 2. We don’t like the breadcrumb coating on top (maybe it’s a Canadian thing eh) so instead I coooked outs for 20 minutes covered with foil and then shredded more cheese on top (just enough to cover all of the noodles) and then cooked it for another 10 minutes. Lastly I stuck it under the broiler (watch it carefully) until it was bubble and started to brown. 3. If you want it to be really cheesy and gooey, don’t use packaged pre shredded cheese. It’s covered in cellulose to prevent it from clumping. Your arm might be a bit sore from all of the shredding and slicing but it’ll be worth it. I’ve found using that cheese can also contibute to the cream sauce splitting and that’s super disappointing. The possibilities are really endless with this recipe. You could add bacon or ham if that’s your jam. Looking forward to experimenting. I will definitely be making this for our next big family get together. Hey Amber, thanks so much for the comments and tips! I’m so glad you found the perfect recipe for your family!! I’ll have to try mine with a bit of hot sauce next time, that sounds delish. Franks forever!!! I made this for our Christmas Dinner. I made it ahead of time as we had to travel. While we opened gifts I heated it up to get the cheeses bubbly with the intention of adding to crumbs later. The crumbs never made and no one knew the difference. A double batch disappeared! Everyone loved it and the Host, my cousin requested the recipe. The only change I made… Used a whole box of Cavatelli, doubled everything else. It fit perfectly in a 9×13 dish. I love Cavatelli! Great idea. So glad it was a hit! Thanks for commenting! My husband & I made this for Thanksgiving dinner & our family flipped. Pretty much everyone said it was the best macaroni & cheese they had ever had & requested it to be made for Christmas Eve AND Christmas Day dinners. We followed the recipe to the T except that we added some chopped & sweated jalapeno, serrano, and habanero peppers & used spicy cheeses for the slices. It was delicious! I’d recommend you make some to share with a bunch of people because this recipe doesn’t hold back on the cals! OH MY GOSH of course you are Starr from Texas. This sounds like a totally Texas version and I LOVE IT!!! I totally am making this!! You’re a genius. Thanks for sharing!! I made this for the first time in September when we were feeding the youth group at church. The entire (doubled) batch was GONE, and I’m pretty sure they scraped some layers off of the pan trying to make sure they got it all! Featured it on my blog under “feeding a crowd” and linked back to you, of course. This really is the BEST Mac and Cheese, ever, thanks so much for the winning recipe! I’m so happy to hear it was a hit Ayme!! Lucky fire department :) Thanks for leaving a review, it means so much to me! That so so amazing.. Thanks for your sharing!! Holy moly!! You weren’t lying!!! This was amazing!!! I did need to add a little more milk and heavy cream when making the cheese sauce, and might do a little less mozzarella as it can be kind of a chewy cheese, but this was incredible!!! Everyone loved it!! This is now my go-to mac and cheese recipe! That’s awesome Annie! I’m so glad it was a success! Yeah the cheese you use is totally up to you, there are so many options. Thank you for coming back to leave a review! Made this for Thanksgiving. Cheese is a staple at our house so obviously my family loved it. This will now be an expected item on our holiday menus. Thank for sharing. 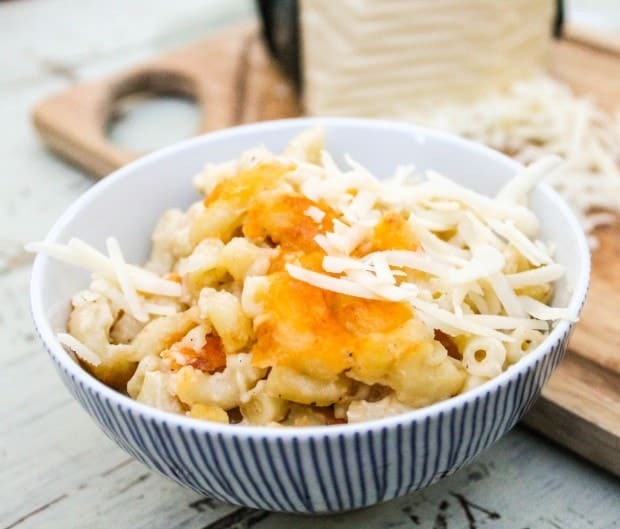 Cheese is a staple at our house too :) I’m so glad you liked the recipe Jennifer! 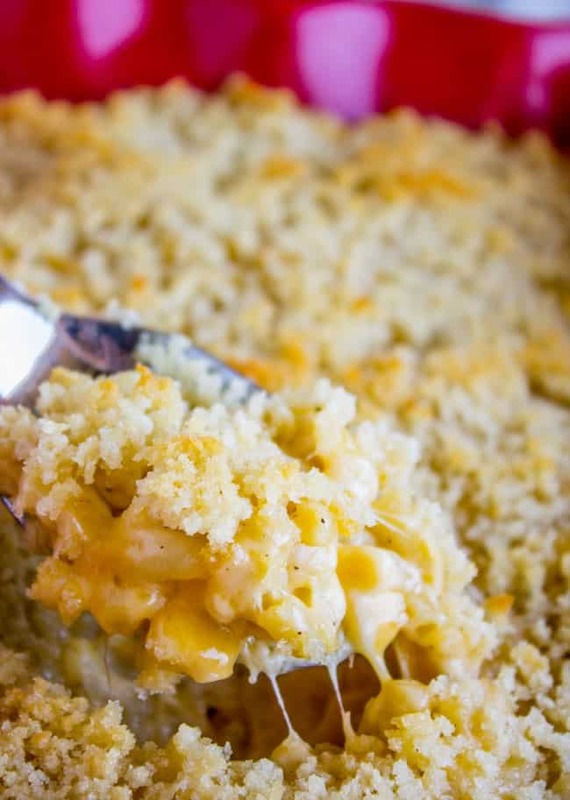 Here’s to all the future Thanksgivings with fabulous mac and cheese! Just whipped up a double batch of this and it’s currently in the oven before taking to my family thanksgiving at 12:00. Of course I got to taste along the way so I’m super excited to see how it’s finishes! Great recipe! You are smart for tasting along the way! I’m so glad you made a double batch, you won’t regret it :) Happy Thanksgiving!! Do you think this could be turned into a gluten-free recipe? Absolutely Katie! Actually the first time I tried it, it was gluten free. just use gluten free elbow noodles and gluten free bread crumbs on top! And gluten free flour for the roux. Any gluten free blend that you find in the baking aisle will do. did you use unsalted or salted butter? Hey Mary! I used salted, but I like my food on the salty side, so if you’re worried about it use unsalted. it will be good either way! Keep in mind that cheddar is pretty salty too. Do you think this could this be made ahead of time and refrigerated overnight/ baked the next day? Yes it can! Just don’t put the bread crumbs on until the next day when you bake it. I bake mine for 30 minutes to get it melty. It’s perfect. H, when you mean flour do you mean all purpose flour? Hey Ruby, yes all purpose flour! Do you use regular elbow macaroni or large? Hey Amy! Uhh…normal size? haha I’m not sure, I don’t think they were extra small or anything. Any size you use will be great! I made theis Mac and cheese and followed the recipe to a “t” …except I doubled it because if it was as good as claimed, we’d need MORE. It was craaaazy delicious and my new go-to when I am throwing caution (and calories) to the wind. What fun is life if you don’t indulge now and then!? Thank you! Throw those calories to the wind! Haha. Good idea doubling, I’m sure you didn’t regret that :) I’m so glad you liked it Amy! Hey Rae! I’ve never tried it that way. It will not get crispy on top, so if you do it in the crock pot you may as well skip the panko topping. I think it would still taste really good though! Spray your crock pot really well! What kind of sliced cheese did u use in the middle? Hi Carey, I think I used cheddar and Monterey Jack! 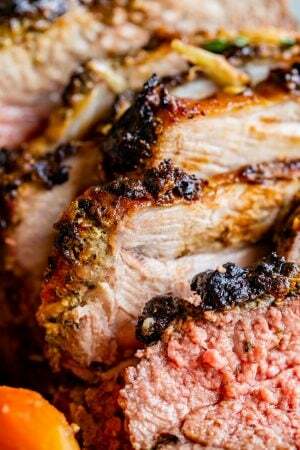 Do you know if I could make this ahead of time then heat it up in the crockpot? I have to travel 2 hours and would like it for a potluck. Hey Rachel! Yes you could but I don’t think the top will stay crispy. Let me know how it goes! How many servings does this make? I was volunteered to make Mac for Thanksgiving and probably there will be about 15-20 people wanting this. Hey Brittany! It really depends on how hungry you’re guests are :) One recipe makes a thick 8×8 square pan. You could double it and put it in a 9×13, and everyone would get a small side serving. If you want to make sure you have leftovers, triple the recipe and make 1 8×8 pan and 1 9×13 pan. Enjoy!! Happy Thanksgiving! When you say “cream” what are you referring to?? I don’t wanna be basic or add just milk?! What is the cream you use? Hey Melinda! Cream is the same as whipping cream. Sometimes it’s called heavy cream. Not cream cheese! :) Enjoy! Hi! Excited to make this dish this weekend! Can I use a difference kind of pasta, such as rotini or shells? Also, about how long, in total, does it take to make this dish?? Bringing it to friendsgiving this weekend!! Made this last weekend for a surprise birthday party – no kidding. This recipe was the hit! Everyone loved it – doubling for Thanksgiving dinner. It’s a “must have” at ours EVERY YEAR. Looking forward to this year and this recipe FTW!!!! Yes I had no idea! We Californians are clearly behind the times!! ;) Enjoy, and Happy Thanksgiving! Okay, we’re diving in and making this dish to bring to our community Thanksgiving — untried! (by us, I mean). So question about the Panko breadcrumbs: plain or will Italian seasoned be better? Thanks! Hey Sahari! You guys are gonna love it! I used regular plain Panko crumbs, but I think either one would taste good! Hey Kim, I think I missed your deadline, sorry! How many did you end up making? Hi! I’m getting ready to make your mac & cheese and am wondering if I can put it all together and then bake it this evening before our guests arrive. Thank you! Hi Connie! Yes, you can! I had to double the recipe as I was serving 6 of us and wanted leftovers. I did add smoked paprika and cooked bacon on top of they layer of cheese!! it was off the charts. Thank you for sharing the recipe. Thank you Jon! I feel like basically any mac and cheese recipe could be made 10x better now if you just add a layer of cheese in the middle! It’s a good trick. Thanks for commenting!! Double the recipe to use an entire pack of noodles. The “extra” freezes & reheats well. Excellent recipe !!! Because we are lactose and gluten free, I substituted lactose free half and half for the milk and cream, elbows made of brown rice and BBQ potato chips for the topping. Thankfully I can tolerate cheese!!!! Ok… So I read the reviews, can’t imagine a Mac n cheese recipe with this much positive results, so… I made it. The rioux (is that the right word, we say gravy if it’s flour and liquid) was easy peasy! I did use the whole cream, splashing a bit more in there. I used the packages of shredded Walmart cheese, I had a variety of several partial packs, just dumped them in. Had to put it back on heat really low. Used sandwich slices of English cheddar, and… Well it worked! Lol, it was great! Of yeah, I used homemade buttermilk biscuits left over crumbled for panko crumbs. Lol. Thanks, it is stellar! Ooh ooh buttermilk biscuit crumbs sounds amazing on top! And I will never say no to an extra splash of cream :) I’m glad it turned out Lisa! I’m so glad you liked it! I suppose the serving size would depend on whether you are serving it as a main dish or a side dish, because mac and cheese can be both. You’re smart to have made 2! Hi ,thx for the receipe. Can i make this mac& cheese mini for a party or i need to add eggs? Hey Eileen! 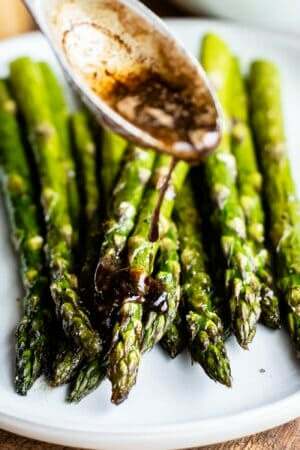 Yes you can make this recipe in any size pan that you like. No, I wouldn’t add eggs. Hope this helps! Hey Kelsey! The sauce instructions are steps 3-6. I need this for a reunion day after tomorrow. How can I change this recipe to fit a 9×13 pan? Hey Carol! You can bake this recipe in a 9×13 pan, just double all the ingredients! Great question! In the past, the sauce in my recipes have always split once baked. The sauce in this recipe stays thick and creamy, and it is so cheesy. It really is a great find! hey James! I’m so glad the recipe worked out for you! split sauce is the saddest thing. Thanks for your review! This recipe is exactly what I was looking for, creamy, cheesy, deliciousness with a crispy crumb topping! Thank you Karen for continuing to maintain your perfect recipe streak with this Mac and cheese recipe. Your blog is my go to source when I’m searching for a new recipe. I added a few dashes of Tapatio and used my own seasoning salt blend to suit my family’s tastes. I also doubled the recipe to feed a group of hungry teens. They loved it! Ah Brandi I’m blushing! Thank you so much. I’m so glad you’ve had success with all the recipes you’ve tried! I love the idea of adding Tapatio’s (LOVE that stuff.) You’re a genius. And doubling when there are teens around is always a good idea, otherwise you might not get any! haha! Thanks for the comment, so good to hear from you! Thanks Karen!! I’m so glad you like it. Thanks for leaving a review! Amazeballs! 15 out of 10. As a Mac & Cheese purist, this is as good as it gets. Make sure to cook long enough in your oven so the cheese in the middle melts properly. Easy to make and will make you a culinary star! Made this twice. Followed the recipe exactly and WOW oh WOW. 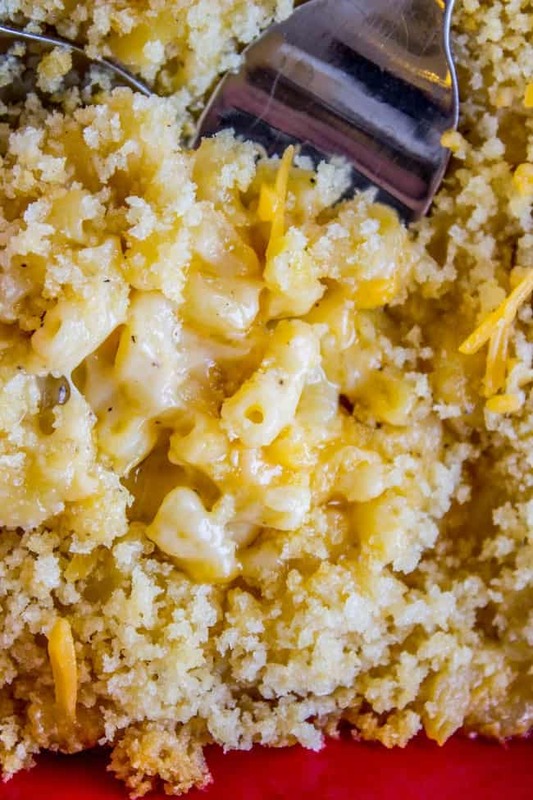 I am a Mac & Cheese purist and I have been searching for this recipe my whole life. Make sure you bake in oven until you see the cheese bubble from the side of the pan to make sure the cheese in the middle is properly melted. 15 out of 10. HOORAY the search is over!! I’m so glad Robin! That is the best feeling! 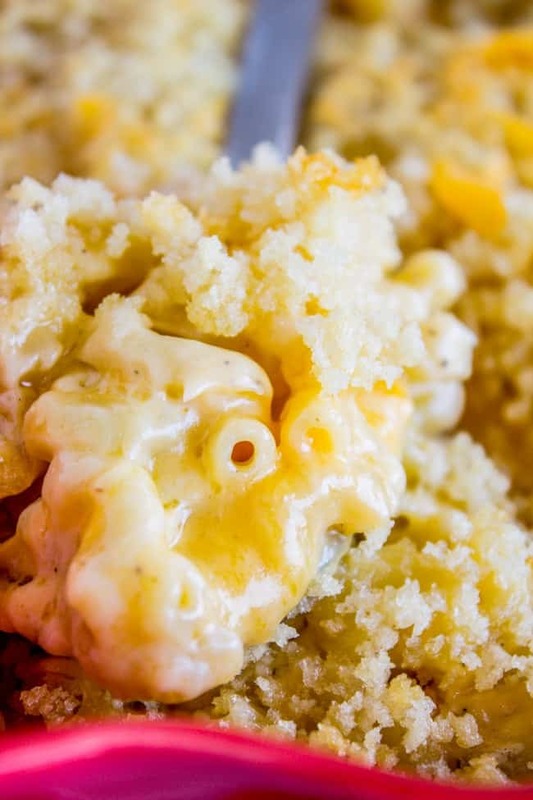 Mac and cheese lovers unite. Thanks so much for the glowing review!! This is pure hedonism, right here! I just made up a batch following your directions to a T, and it came out perfectly. There’s a problem, though. The recipe says it serves 6. My two teen boys ate early so they could get to their rehearsal, and there’s not enough leftover for me and my mom!! So I cooked the rest of the box of elbows, added it to the remainder of the mac & cheese along with a bit of cream and a handful of shredded mozzarella and mixed that up good. Put it back in the casserole, layering with a few more slices of cheddar and Monterey Jack, and popped it back in the oven for another 10 minutes. Still perfect!!! Next time I will cook the entire pound of macaroni and adjust the remaining ingredients accordingly. But I wouldn’t swap out any of the cheeses for anything, especially processed cheese. This is a winner!!! Pure hedonism, lol!!! I can understand how this might come short of serving 6 if you have teenage boys. Endless appetites! Good idea adding more cheese and putting it back in the oven. Thanks for the helpful comment Kathryn!! Before I give this a try, I could use some tips on the cheese. I recently tried a recipe with loads of cheese, but it looked curdled. I don’t know what I’m doing wrong, and really want to nail your recipe. My family loves mac n cheese, and I very much want a great recipe to work this time. Any help will be appreciated. Thank you. Hey Ellen! Great question! I’ve never had issues with this, and I think it all comes down to quality of ingredients. Make sure you are using name brand sharp cheddar (I love Tillamook) and a good quality mozzarella. Use whole milk. Form your roux by SLOWLY whisking in the liquid, take at least 2 minutes to get it all incorporated. Turn off the heat before adding the cheese. Make sure all the cheese is prepped and ready to go before you start making the roux. i hope this helps!! You got this! Good luck! It literally is the best Mac n cheese!! Yessss another believer ;) Thanks Cheryl! This is HANDS DOWN the best recipe for mac and cheese I have made! I did add a little more cream than called for to thin it a little, but that’s just me. Fantastic recipe! You can never go wrong with a little more cream I say. Somebody put that on my tombstone please ;) I’m glad you loved it! Thanks for the review! Awesome Peggy! We never make mac and cheese at Christmas, but I get people commenting all the time that they make this for the holidays. Clearly I need to get with the program because that is a great idea!! 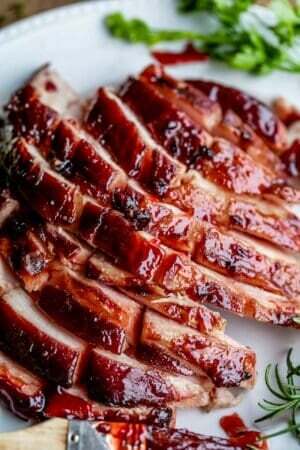 Hi there, I am planning on making this recipe for Thanksgiving. I would need to serve 25 people. This would be a side dish. I am thinking of tripling your recipe or even quadrupling. Should I modify any ingredients or multiply each amount by 4 and stick to the recipe exactly? Hey Jazzlynn! I think you will probably be fine tripling it. And no, I wouldn’t change a thing! Just scale it all up. Enjoy! what cheese do you use of the half pound? Hey Linda! I used half cheddar and half Monterey Jack I think. Sky’s the limit! I’ve seen other mac n cheese recipes where they tell you to undercook the macaroni (boil for 5 minutes or so) to keep it from being too mushy (because it gets baked in the oven too). But your recipe says to boil the pasta according to package instructions. Has the texture ever been a problem? or does the panko bread crumbs help with that? Sorry if that’s a weird question. I’ve never made homemade mac an cheese so I’ve been researching a lot. lol. That is a great question Liz! I like my pasta super al dente so that is how I always make it, which means that it comes out of the oven perfectly tender. I wouldn’t say under cook it, but read your package instructions and set a timer for maybe like 1 minute less than then LOWEST suggested cooking time. Then taste a noodle and see what you think! Keep it in for one more minute if it still seems hard, then drain right away! I hope you love the mac and cheese Liz! It’s a huge favorite over here! This looks delicious! I plan on making it. Could you use smoked Gouda slices? Thanks Kelsey! Heck yes you could use Gouda! That would be amazing! Oh hurray! Funny thing, the first time I tried this recipe it was gluten free. My friend made it for us, and one of our other friends has Celiac. It is good either way! Hey Sarah! Sorry for the late reply! This recipe as written makes a 8 or 9 inch square pan. That would serve 8-9, max. You might need to triple it! The recipe doubled fits into a 9×13 pan. I guess it depends on how may side dishes you are serving too. YES! I’m so glad it was literally the best for you too! I can’t wait to try this with Muenster. That sounds AMAZING! This is SO perfectly named. It iS LITERALLY THE BEST MAC N CHEESE EVER. I made it to use up some cheese we had leftover from a big party. I used Muenster and Monterey Jack in place of Mozarella and it was DELIGHTFUL. Even my husband who is kind of indifferent about homemade Mac N Cheese said it was good. It wasn’t grainy, and so creamy! Loved it (as you can tell). Thanks for this recipe! I made this last night and it is amazing!! It will now replace my old Mac and cheese recipe! My kids and husband loved it too. Thank you for sharing such a great recipe. That’s awesome Laura! I’m so glad you and the family liked it! Hard not to like that much cheese :) Thanks for the review! This sounds so good! Confused on what kind of cheese slices that you used. Hey Brandi! Here’s the note at the bottom: “**Cheese of your choice. I did half sharp cheddar and half Monterey Jack.” (Basically whatever you want). Hope you love it!! Hey Karen, I tried this recipe today and it turned out terrific! Followed the basic recipe just added a little hot sauce to the sauce. YUM! Thanks for sharing. I’ve never tried it Jeri, but I imagine it would freeze very well, just like any casserole! Let me know how it comes out! Hi! I wanted to let you know this does freezes well! I made it all the way until the final step, then I thawed it and added the panko/butter mix before throwing it in the oven. You are awesome Jeri! That is good to know. Thanks for coming back to let us know! Hi. I can’t wait to try this recipe for Thanksgiving. Quick question… Huge family… Lots of mouths… And macaroni and cheese lovers. Can the recipe be doubled for a 9×13? Hey Leslie! Yeah totally! I’ve doubled this before. I hope your family loves it!! So if you double this recipe, would you also double the cheese and ALL the ingredients! I want to make this for a crowd. This looks amazing! But question.. Id like to make something like this for a large group, is there anyway to do this process/cook in a slow cooker? Just curious, thanks! Hey Madeline, to adapt this recipe to slow cooker you would have to use an entirely different method I think. I’ve never tried mac and cheese in the slow cooker, but I know there are lots of recipes out there! Look around! I made this last weekend and it was the Bomb! I hesitated to add All That cheese…but I Did and so happy for it. I also added caramelized onion and YES, some crumbled Black Forrest bacon. I’m telling ya’ HEAVEN. Thanks for the recipe! I’m so glad you went all in and added the cheese Kendra!!! Worth it. Also, bacon!?? And caramelized onions?? You’re killin me. Need to try it! Can you advise how you add the caramelized onion & the bacon? Just raw? On each layer of cheese? Hey Ann, I haven’t tried this recipe with any add ins, but if you are adding bacon you definitely need to cook it first. 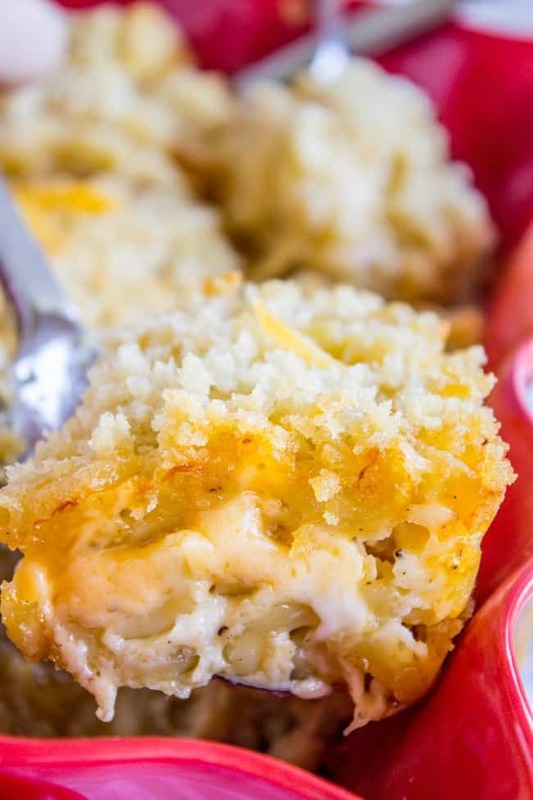 You can do it in the oven, then crumble and add in to the mac and cheese however you like. 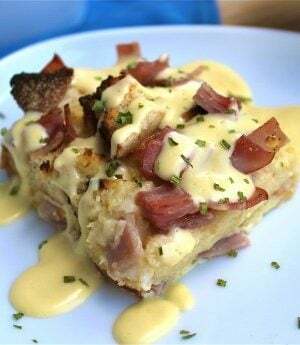 (https://thefoodcharlatan.com/how-to-bake-bacon-recipe/) Enjoy! I don’t even know how to respond to this! Mymymymymyyy!!! This has my name and probably everyone’s name written all over it! This is sure to be a family favorite! Thanks for sharing! Thanks Annie! I think it DEFINITELY has your name written all over it!! :) ‘Merica. Oh my goodness, poor Tyrone! At least he got to have some of this amazing mac & cheese as a consolation prize, right?! I have always been “more is more” when it comes to cheese in pasta, so I already know I will adore this recipe! Haha. He took the beating pretty well :) And at the end of the day we had 2 pans of mac and cheese, so who’s complaining right? Thanks Elizabeth!! my favorite mac & cheese is the martha stewart recipe (with a little dry mustard added bc i love that in mac & cheese) – i love that it comes out still cheesy! too many mac & cheeses taste pretty good but it ends up being just like…shiny macaroni by the time it comes out of the oven. all the good stuff disappears. you need tons of thick sauce & cheese. but this…this is on another level! i also love cheryl’s fb comment up top about doing scalloped potatoes this way, genius! I wish that I lived in your neighborhood – every day I would keep a watch for your porch door to open! This macaroni and cheese looks amazing and I plan on making it the next time my children and grandchildren come for a visit. They will be sooo happy! Thank you for all the good recipes and for your comments too. They always make me smile – and as one of your fellow Americans who will probably die happy, keep cooking just the way you are! Haha! Except on recipe failure days. Then you would definitely not want to hang on my porch :) Thanks so much Anne! I appreciate your kind words! What the heck is “hella” cheese? Also, how did I not hear about the mac & cheese contest?!? After eating my mom’s amazing mac & cheese recipe (which you know of course, is legendary in our family) I had serious doubts about your title “Literally, the best mac & cheese” . . . blah, blah, blah. Yeah, sure Karen. Then I saw the layering of all that cheese and I concede you might be right. I’m willing to give it a try. I’m pretty sure Chip will fall in love with it being the cheese guy that he is. I will give it a try! I thought of you when I made this. Your recipe has been my favorite for years and years, and I will still make it most of the time probably. Because I don’t ACTUALLY want to die young. Hella cheese? I miss California! Right? See Kris’ comment below. (“What the heck is “hella” cheese?) long live Central Valley.